Ensuring your Business's Sales growth and future. We are excited to announce our newly enhanced Customer Relationship Manager (or CRM) and Sales Growth Tool – LEADS 5.0. Now with a FREE edition for very small businesses or those wanting to trial LEADS 5.0 with no strings attached. WHAT - is LEADS software? 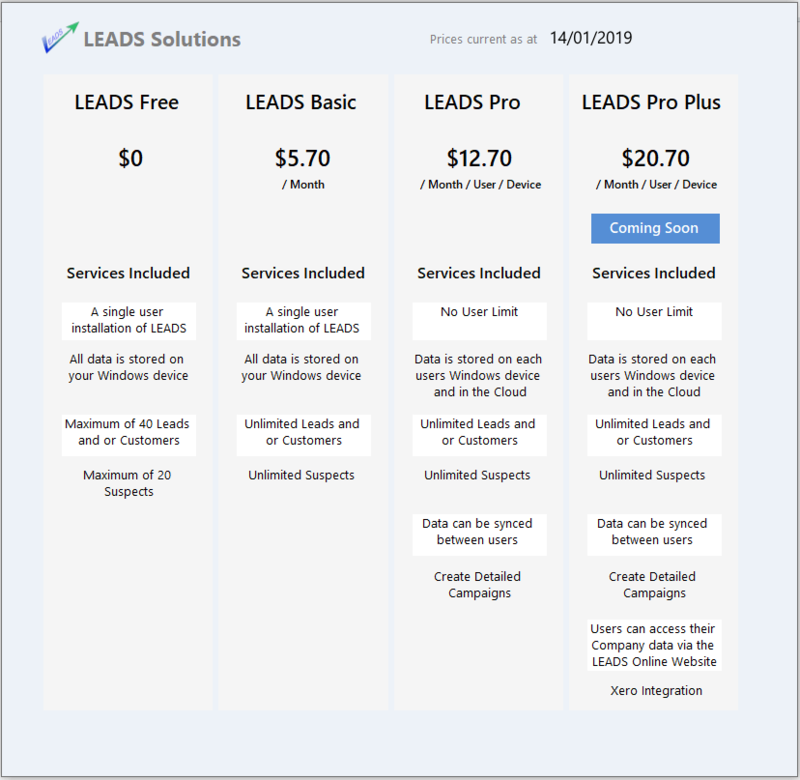 LEADS is a powerful, lightweight, Business to Business Sales tool and Contact Manager for use on Your Windows Tablet, Laptop or Desktop PC. Your Sales Staff in the Office and Field need LEADS to store and manage their Business Sales Funnel and Contacts. You can prioritise and target Customers and view rich data analysis of Your Clients, Leads, Targets and Suspects or Prospects. WHY - should we use LEADS? To improve your Customer Management for a better Customer experience and to increase your productivity and efficiently target your Sales Teams' efforts. LEADS helps you to sell more, stay better informed about your Clients and improves your Customer relationships. LEADS is EASY and intuitive! No dedicated Staff are needed to set up, run or maintain LEADS. WHERE can we use LEADS? LEADS can be used anywhere and any time on your Windows Desktop, Laptop or Tablet. No internet connection is required! 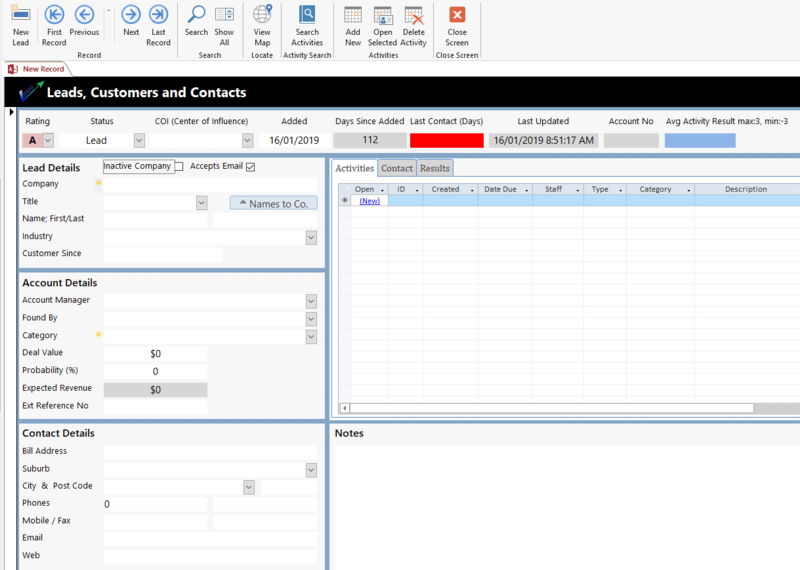 Later when connected, you can Sync your data with your Sales Team (pro version).ro version). HOW - can I get LEADS for me and my Sales Team? Dashboard overhaul. Compare this months figures to lasts or this first quarter vs last years first quarter etc. What does LEADS do for me? LEADS manages Your “Sales Funnel” to help you grow Your Business and gain new Customers. Use LEADS to identify, track and manage your relationships with existing Customers and Contacts as well as Potential Customers. Avoid making those dreaded cold-calls! Instead be referred to potential Customers by your close associates or centers of influence! LEADS sales process is partially based on the “Sales Development Program” developed by Sales Impact Group’s Brett Burgess. This program emphasises the "Sales by Referral” technique where other business owners or friends that you are interacting with frequently are able to refer your Business to others and vice versa. This is a proven sales technique designed to get your Business name to where it is needed as opposed to passively advertising and waiting for leads to come to you. Sick of making hundreds of cold calls resulting in hang-ups, depression and single digit percentage follow ups? LEADS is different. Create a list of "Suspects" or prospects - Companies or individuals that potentially have a need for your product or service. Pursue referrals to these "Suspects" via your inner circle of Associates or "Centres of Influence" (COIs). Someone you know must surely know one of your suspects and can refer your business to them. We all know that a close colleague recommendation or referral is highly valuable and can achieve much higher sales figures than cold calling could ever do! LEADS tracks and manages your Suspect list and substantially automates the task of asking for referrals, freeing time for the actual sales appointments you gain. Additionally LEADS has a full Customer activity tracking and reminder system included. Once a Referral is made to the Suspect You Contact the "Suspect". By merely contacting the "Suspect" and gaining their details, we convert our "Suspect" to a "Lead". Here we set up a meeting to discuss the needs of the "Lead" and identify Sales opportunities. Convert your Lead to a Customer by persuading your Lead with a lucrative deal, quality service or product(s). Should you not succeed there is always potential for a sale in the future. Be sure to remind them of your services regularly and set up repeat follow up communication. Offers full enterprise wide sharing of Your LEADS data, plus remote operations with full synchronisation utilising the bullet proof Microsoft Azure Cloud database. This enables your Sales Team to take their Windows laptops and tablets on the road and have full access to all the companies data, while allowing for edits and updates, that can later be synchronised and shared with everyone when back in the office or via any handy wi-fi / Internet connection. Full sharing and Cloud Synchronisation of Suspects, Leads, Customers and Company Data for ALL LEADS Pro users. Robust and Detailed Campaign Creation and assignments. Informative Campaign Reporting and Graphical Analysis. Staff Account Preferences to individualise your LEADS Experience. LEADS is a Customer Relationship Manager, designed to manage your existing Contacts and Potential Future Customers. LEADS keeps track of your efforts to communicate with Business' and Organisations of interest. LEADS software gives you the ability to define Categories and Classify your individual Contacts / Customers and Leads so you can mange your "Key Accounts" or target your "Potential New Sales." 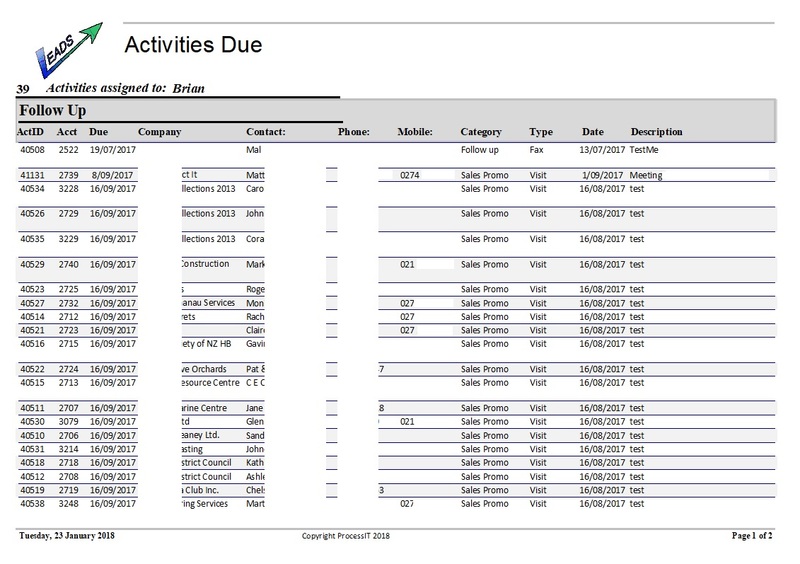 Record Activities for each Contact / Customer or Lead and assign these to Staff for action then track all incoming contact from these too. Set Due Dates and Completion Dates for later analysis of Staff performance. 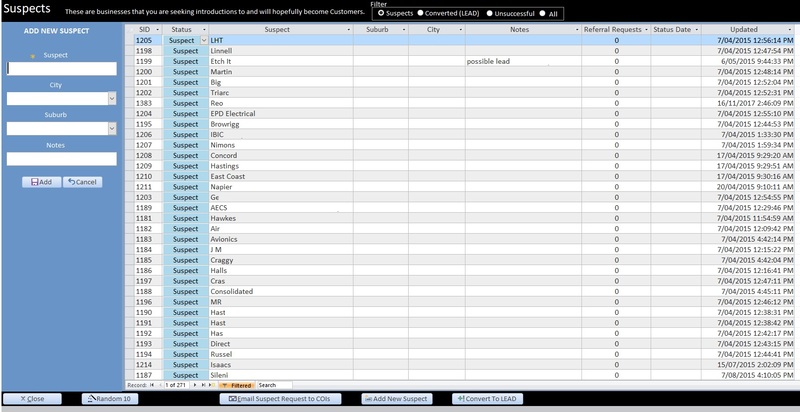 Produce Reports for your Activities, Customers and Staff-Lead-tracking. The LEADS database is Uniquely Located on each computer it is installed on. This means that each install of LEADS has it's own personal data available anywhere, even when off-line. LEADS works as a standalone system for each user. If you need to share data with your colleagues you need to upgrade to LEADS Pro where each user will have access to the Sync tool. LEADS Pro Users gain the added benefit of being able to Synchronise information within your Company. At the press of a button your Companies LEADS Data will be Synced to the Cloud Database where it is shared to the rest of your Sales Team. You'll be amazed at the time and effort saved, how quickly results are produced and the simplicity of managing your Customers and Leads while Growing Your Business! Did you notice a new Business while out recently? See the Logo of another on a Car passing you? Simply add these names to LEADS "Suspects" list -Businesses that may become your new Clients or Customers. LEADS will automate the sending of Referral Requests to your Close Associates or "Centres of Influence". A single click will automatically email all your "Centres of Influence" with your preconfigured message and a random list of Suspects to whom you are seeking introductions - it couldn't be easier! Talked to a Client or Customer and told them you will call back in 2 weeks, then FORGOTTON? Arghh! This makes you look very unprofessional and disorganised and worse, may even result in the loss of a Customer and their lifetime of revenue. LEADS will manage all your reminders -simply locate your Customer and add a new Activity to Phone them to complete the sale. Set the Due-Date and LEADS will prompt you that day to make the call! No answer? Make a note and reset the Due-Date to the next day. You have 100 LEADS and want to know which ones have Activities Due right now! We have you covered. Preview and print Reports for you and your Staff, organised by Staff-Member and the Activities most Urgent, so you can easily track who requires attention first. We all know you must stay in contact with your Customers and Contacts don't we? But it is so hard to manage, that few of us bother! Now LEADS makes sending your Newsletter painless! Simply type your newsletter in a normal Microsoft Word document, add images if needed, then add a few simple merge fields for LEADS to replace with things like your Contacts Name and Company. Save, Point LEADS to it and hit Send. LEADS will Merge the document with the Client List and send each one a Personalised email using Outlook. No! LEADS has been designed to be EASY, with a minimal learning curve and simplicity in mind. You will very quickly be proficient in it's use. Additionally LEADS features a modern "Fluent Ribbon" interface so you can quickly locate all the important functions. Great, We need it! Where do We get LEADS? Just click here to Download your copy of LEADS - LEAD Tracking Software, the solution to ensuring Your Business growth and stability. The Download is Free. (Your ISP data charges may apply). The LEADS application can be used straight away FREE with some limitations. If you wish move beyond the free LEADS edition then monthly payments per User / Device are required and can be purchased from within the LEADS Application. If you have LEADS installed already and you have an active internet connection then simply open the LEADS application and LEADS will prompt you to install the latest version. However if this is not the case and there is no prompt or LEADS is not installed then simply download the free Installer for the Latest Version of LEADS here. If LEADS is already installed on your machine and you want the latest version of LEADS then simply download the new version and Install it. No need to un-install the previous version. LEADS will preserve your data and only install the new features. Un-installing LEADS WILL remove your data stored within the LEADS database! We strongly recommend you copy or export your data file before un-installing LEADS. Note: Office 365 Professional versions already include Access. MS Word for Newsletter editing and Outlook for sending.